You will get the recipe if you read the whole post! 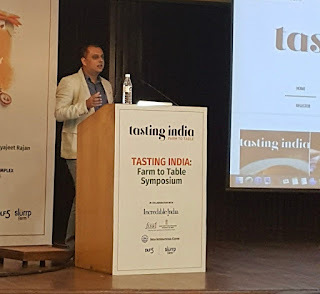 As you probably know, I was in New Delhi last week, participating in the most enriching, thought provoking and inspiring Tasting India Symposium. 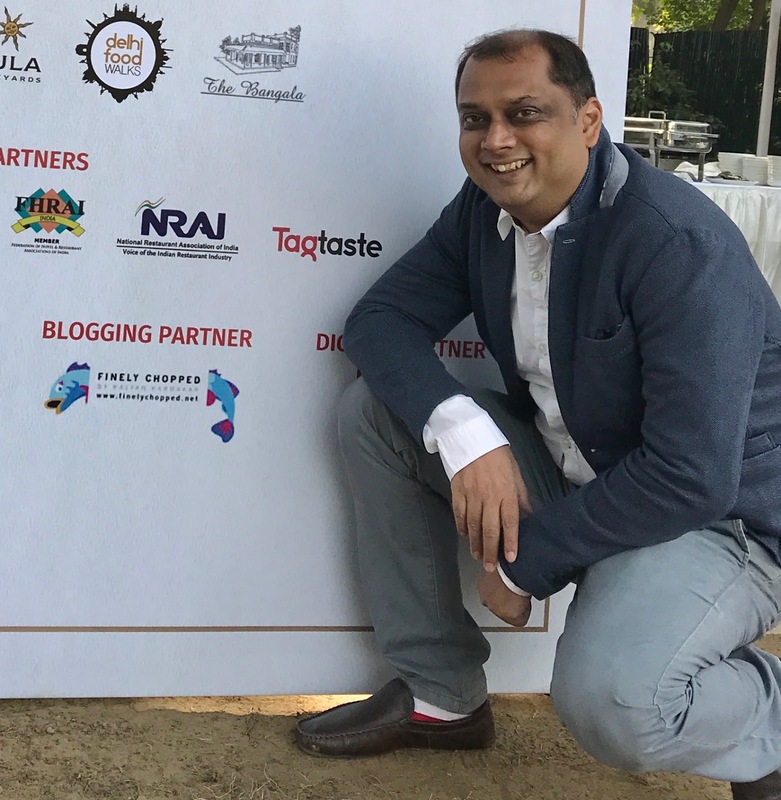 I am proud to say that Finely Chopped was the blogging partner for the event. Ms Madhur Jaffrey CBE, arguably the most passionate and well regarded global ambassador for Indian food, was the keynote speaker there. While I had often seen her food shows on television before, I had never met her in person and was quite excited about the opportunity to listen to her talk. Tales of the indefatigable energy and drive of this 84 year old legend had reached us in Delhi even before we got to see her. Turned out that her original flight from New York had been cancelled and her ability to come to the meet in time was in question. However, there was no stopping her it seemed and she got on to another flight after a 10 hour break we were told. She then headed out to New Delhi, after managing to retrieve her luggage in the process. She landed in Delhi, after her long flight across the continents, and went straight to the Tasting India dinner which was held at the DLF Gurgaon Club. She apparently regaled the audience with her spirited talk and was the last one to leave the party, which went on till late into the night. Just to give a perspective, I should tell you that my group of fellow outstation media folks and I, had decided to give that particular dinner a miss. We had felt travelling for an hour from New Delhi to Gurgaon in the evening to make it to the dinner would be a 'bit' hectic . We had landed in Delhi from our respective cities across India the previous day and had spent most of our time at the conference since then and felt the need to recharge our batteries. Ms Jaffrey’s spirit and energy made us feel like 84 year olds in comparison! Ms Jaffrey was there at the India International Centre on the clock the next morning, well before lunch. Giving interviews, talking with her many eager fans who couldn’t get enough of her. This included me too! It was apparent from her talk that she had listened intently to the discussions that had happened earlier. She made references to them through her talk which was about celebrating the world of Indian food. She then went on the make her case by referring to food that she has come across in her travels across India. She further endeared herself to me, not that I could have been any further smitten, when she started by referring to a Bengali gentleman whom she had once met at Kolkata and who had apparently told her, “there are three great cuisines in the world French, Chinese and Bengali.” She went on say that she agreed with the Bengali gentleman and waxed eloquent about the bhaaja, jhols and jhaals and bhaapas of Bengal. Just when one thought that her's would become a Biswa Bangla talk, Ms Jaffrey switched gears to talk about Hyderabad and about how she would walk miles to have the kachhe gosh ke biryani and the patthar ke gosh there and then about Andhra pesarattu dosa that one must eat when at Hyderabad. She moved on to Goa, and to the bebenca, there which had Ethel Da Costa, the Goan in our media group jumping up and down with glee, just as I had earlier during the Bengali food rhapsodies sung by Ms Jaffrey. For the next twenty minutes or so, Ms Jaffrey spoke about the many wondrous dishes of India. Let me give you a few examples. She reminded us that she was originally a Delhi girl when she spoke about the daulat ka chaat that you get in its bylanes and then, switched geographies without our realising it, most lovingly described the many layers of the puff pastry of the malai nu khaaja of the Bohris of Mumbai, and the joy of reaching the dab of malai at the end in it. She next headed to Gujarat and spoke evocatively of the khandvi made by the old ladies of Ahmedabad, which she said she explains to the world at large as a 'pasta roll which melts in your mouth'. She reminisced fondly about dipping pillowy dhokla, white and not the yellow khaman of course, into Aaamras during summer at Ahmedabad, before she headed south and talked about the wonders of the appams of Kerala and the flavor burst of the rassam vadas of Bengaluru, which had Ruth DSouza Prabhu from Bangalore, skipping with joy just as Ethel and I had when our states were spoken about. Ms Jaffrey concluded our culinary tour across India with Kashmir which visibly held a special place in her heart. She spoke of the gushtaba (a hand pounded meat ball) which she said that Pandit Nehru had apparently described as the ‘pashmina of the meat world'. She then praised the wonders of the breads baked in Kashmir. This time the eyes of chef Prateek Sadhu of Masque, and a Kashmiri to boot, lit up with pride. She concluded her speech, more like a kind grandma whose cheeks you want to pull, than the diva that she actually is, by saying “someone please help me get down from the stage,” while the audience gave her a standing ovation. It felt almost as if she was entrusting her legacy to us and telling us, "I have done my job, now it's up to you guys to take it ahead." What Ms Jaffrey did through her talk, was to tell us that there is no need for us to be defensive about our food heritage. Earlier in the symposium, I had heard some speakers talk about the need to make our food 'look better' and to 'taste different' to make it appeal more to a global audience. This reminded me of some Indian chefs and restaurateurs, who have made it big in the global stage, and who occasionally talk apologetically, if not disparagingly, about the food of India while they make the point about how they have taken on the burden of salvaging how the world looks at Indian food. I could never identify with this sentiment, though I know that such folks are well regarded by many back home. What I have come to realise over the years is that for the world to respect Indian food, we need to do so first ourselves. 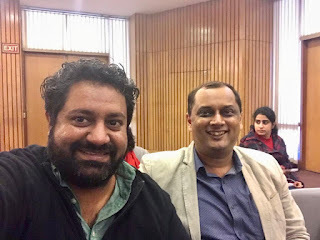 That if we are defensive about it instead, then it will show in how we talk about India food and consequently in how the rest of the world sees it. This, to me, was the take out from Ms Jaffrey's talk too and it felt reassuring to hear her words on the subject. Ms Jaffrey further said, that we should not look to the world to save our food or to recognize it. That we need to do the 'work of eating and preserving our food' by ourselves instead. 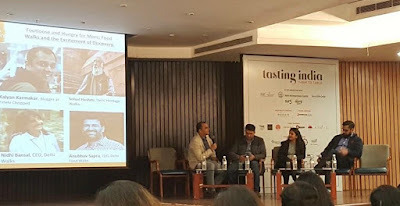 By giving examples of the many wonders of food from across India, of food that is an integral part of our day to day life, Ms Jaffrey proved to us, and reminded us, that the beauty of Indian food is lying out there, resplendent in front of our eyes. It is for us to open our eyes to its glory. To make her point, she gave an example of what was discussed in earlier sessions at the Tasting India symposium on Ayurvedic food and on ancient grains such as millets, and said that this knowledge will spread through osmosis. It is part of our legacy she pointed out and hence we needn't feel too hassled about it. That we should enjoy the journey instead. Ms Jaffrey told us to look in to the kitchens across the country and to the mothers and grandmothers there who cook up wondrous and diverse dishes in an attempt to preserve our heritage. "Let's not wait for the world to do it, let us do it instead," was her clarion call. I had had gone up to Ms Jaffrey before her talk, and had give her a copy of my book, The Travelling Belly. I had one copy with me which I was really keen to give her. even if this meant pushing my way through the crowds that wanted to speak her, to do so. I got a fan boy photo taken too while she was waiting to be interviewed by a TV channel. I did later wonder if she’d even remember me from the crowds. However, we did have our little moment during her talk that followed and that I referred to earlier. What happened was that I’d immediately raise my hand, like a teacher’s pet each time that she would mention a dish, the pesarattu or bebinca or malai nu khaja for example, and ask if anyone had tried it. She would see me and smile when I did so. Then she finally found a dish that I hadn’t tried or heard of before. This was the sagla bagla of Surat. A very delicate puff pastry as she described it to me from the stage. She giggled happily when I told her that I had never heard of this dish before. I later told her that my mother in law is from Surat and that I would use the new found information that she (Ms J) had given me to impress her! 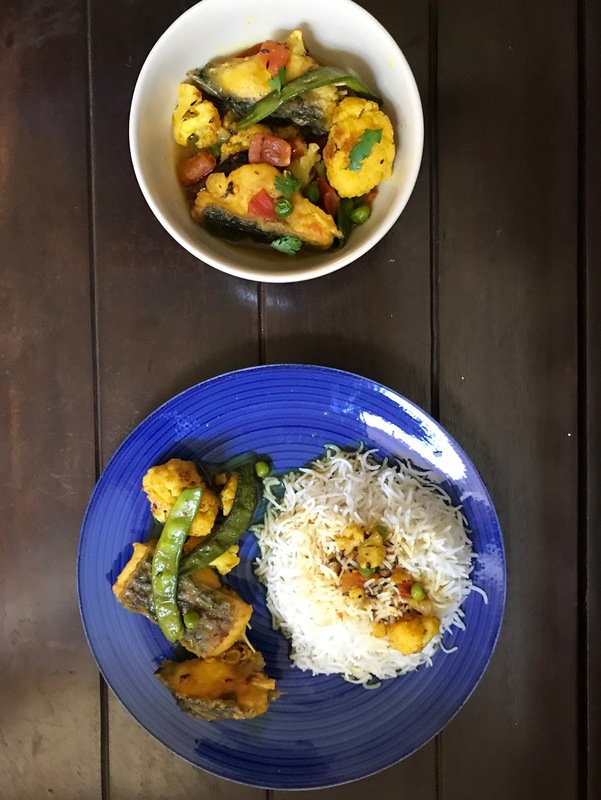 Madhur Jaffrey’s talk from that wintry and chilly afternoon at Delhi came back to me a few days later when I was back in my kitchen in balmy Mumbai. I had just found some freshwater kaatla that in the fridge. I decided to make a machher jhol, a light and watery Bengali fish curry, which has no grated coconut or coconut milk in it, with the fish. The recipe that I used is my own. Based originally on recipes that I had seen on the internet. I had once asked my grandmom for her machher john recipe. Not used to giving out recipes, Didu (my granny who is now 90 herself), gave me one filled with approximations (andaj in Bengali) and not exact measures. My granny was born in Dhaka in what was once East Bengal. You got fish in far more abundance there than in the west of Bengal which is a part of modern India. Given that the fish was fresher in the east, the cooking their used minimal spices compared to those from west. that's another Ghoti Bangal, west and east, food difference. 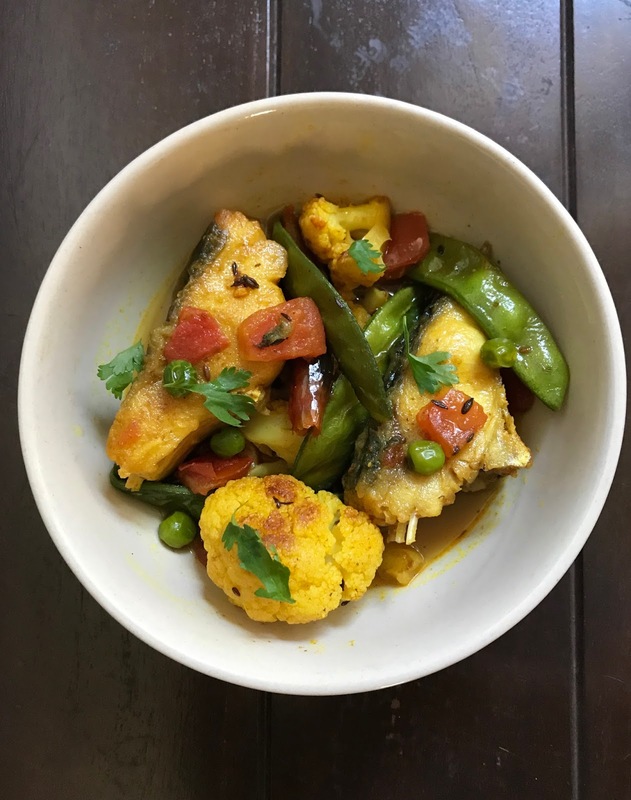 I have eaten didu's fish curry many times of course and memories of that guided me in the kitchen when I cooked. I also remembered how Didu (granny) always uses vegetables which are in season in her kitchen. Inspired by that, I took out a cauliflower, some green peas and sheem (papdi in Gujarati and a sort of flat bean) to add to the curry the other day. These were winter vegetables in the Calcutta that I had left, even though you get them all year round now in Mumbai. What Madhur Jaffrey had said about spices enhancing the flavours of Indian dishes was something that I remembered when I sat down to eat, as that is what the subtlety of a good machher jhol is all about. Extracting maximum flavours with minimal spices that is. Something Bengali restaurant owners and chefs don’t seem to get. Nor did the the one time TV food show host, and a Bengali, who had referred to this curry, when I had once posted about it on Facebook, as ‘rugir khabar’ or food for patients. No, not every curry has to be brown in colour, reeking with masalas and oil, and with the fish fried and then cooked to oblivion. That doesn't represent the poetry of Bengali or Indian food. This is Indian food too. This brings me back to my point, that unless we value our own food and proudly tell its many stories, then noone else will! And it's not just me who said it, Madhur Jaffrey said so too. So here, it is, my machher jhol recipe, made with winter vegetables. As requested for by Ms Madhur Jaffrey CBE to cook, figuratively, even if not literally. At the end, add a few more drops of mustard oil for adding a dash of Bengaliness to it. I got the idea for this from the way Italians add olive oil at the end to a dish. Coriander leaves are the preferred garnish. Micro greens are yet to enter our kitchen even though every new cafe here seems to use it. Machher jhol is best enjoyed with steamed, short grained white rice as most of my fellow Bengalis will tell you. I prefer basmati though. I think that's fine!